When it comes to clothes I'm usually really picky and like what I like, but if there's one other person(except my mammy obv!) who knows me well enough to pick clothes for me it's my bestie! She lives in Australia (which breaks my heart! :() but she still manages to keep on trend with everything I want to wear! 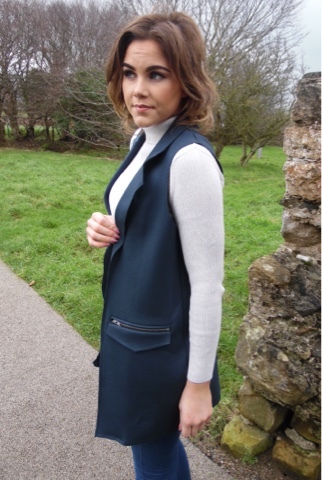 I love Longline blazers/gilets so much and I am obsessing over Navy at the moment! So when I opened this up I was so happy-She knows me well! Although it looks heavy it's actually really comfortable to wear and is surprisingly light when on. Dressed up or down or even layering this will be so perfect. I have been on the hunt for the perfect pair of navy ankle heeled ankle boots for about 7 weeks! I really have looked everywhere that I could, finding navy boots is so hard at best of times but finding the exact colour of navy, heel and shape I was after was like a treasure hunt! But luckily Mark was on hand to show me these beauties! I watch Lorainne almost every morning and their fashion never seems to fail, and either does the price! Honestly I had never heard of LaRedoute before, so this was new to me. Even better? They were on saleeee! (The best feeling when you find something you really like!) but even better Mark gave me a discount code to use. These were already on sale from £95 to £47.50 but with the code it came down to £38 including delivery. Like how could I pass these? I know I use any excuse for a new pair of shoes but hey, when your saving that much money it's a must! They arrived this morning, fit like a glove and are even more perfect than I imagined them being! Even though it's coming into spring/summer I know I will still wear these so much!